During Spring 2017, Gigi Bliss was feeling lethargic, became ill with influenza, and then developed breathing problems that led to pneumonia. “Through the summer months I never got better and then I started going downhill,” she said during a recent interview. “At first, I attributed that to overactivity. I had sold my house and was preparing to move,” Bliss said. Then, during a trip to Mexico with a friend, she suffered sunburn, fatigue and muscle ache. “I got a severe sunburn that never went away,” she said. She consulted her family physician who referred her to a dermatologist; and later the dermatologist referred her to a rheumatologist. After a series of tests by both medical specialists, Gigi was referred to the Mayo Clinic Health System in Rochester. Gigi was diagnosed with dermatomyositis. She had been suffering from severe fatigue, skin rashes and worsening muscle weakness for nine months by this time. “Fortunately, I had the classic rash that was the telltale sign of dermatomyositis,” Gigi noted. Dermatomyositis is an uncommon inflammatory disease marked by muscle weakness and a distinctive skin rash. The cause of dermatomyositis is unknown, but the disease has much in common with autoimmune disorders, in which the immune system mistakenly attacks body tissues. Small blood vessels in muscular tissue are particularly affected in dermatomyositis. Inflammatory cells surround the blood vessels and eventually lead to destruction of muscle fibers. There’s no cure for dermatomyositis, but with proper treatment, remission can occur. 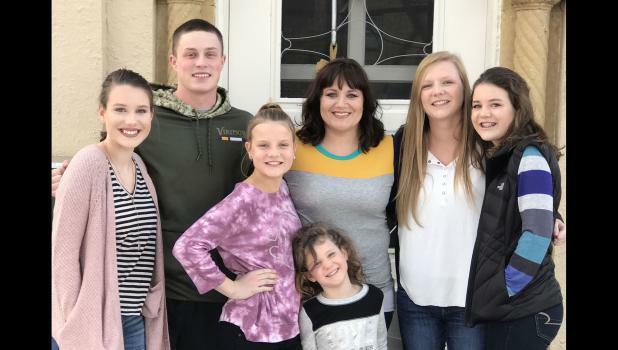 Gigi is a single mother of four daughters: Grace, 16, Emma, 13, Lily, 11, and Jozie, 6. She has two stepchildren, 22-year-old twins, Kolten and Kelsey. See this week's issue of the Springfield Advance-Press for complete story.